Whether you’re planning a rustic country kitchen or a more contemporary kitchen/diner look, Leisure has a range cooker to suit any kitchen style. 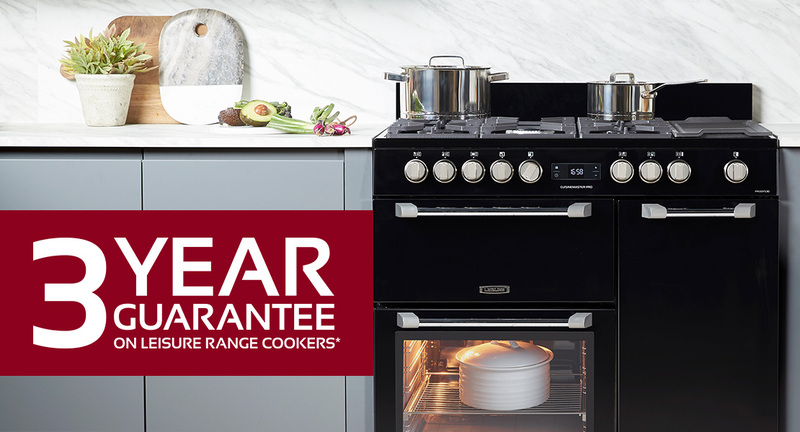 As an extra incentive, purchase any Leisure range cooker between 12th April and 30th June 2019 from a participating retailer*, and we will give you an 3-year guarantee. To activate your 3-year guarantee*, simply fill in the form below to register your product. Serial Number Need help finding your Serial Number? This can be a scan or a photo, but should be clear enough to read the details. Max size 5MB. We need to validate the retailer from your receipt and will contact with you within 30 days to confirm product registration. Please ensure all your contact details are correct. Leisure may contact me with news and information about the company and its promotions. Authorised Leisure partners may contact me occasionally regarding their promotions and services. Click here if you would prefer to download a postal claim form instead.